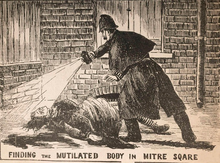 Jack the Ripper (Seac an Réabthóir) a thugtar ar shraithdhúnmharfóir nár gabhadh riamh, a bhí gníomhach i gceantracha bochta thart timpeall ar Whitechapel, Londain sa bhliain 1888. Maraíodh striapacha go brúidiúil. Bhí an dúnmharfóir ag gearradh na bputóg astu mar a bheadh sé ag foghlaim anatamaíochta - mar sin creideann a lán inniu féin gur dochtúir nó máinlia a bhí ann. Glactar leis gur cúigear a mharaigh sé (cuirtear mná eile san áireamh ó am go chéile). Timpeall ar lár na naoú haois déag bhí lucht inimirce ag tonnadh isteach ó Éirinn, agus iad ag cur fúthu i gcathracha móra na Breataine Móire, East End i Londain san áireamh. Ón mbliain 1882, bhí dídeanaithe Giúdacha ó Impireacht na Rúise agus ó Oirthear na hEorpa ag socrú síos sna plódcheantair chéanna. Bhí ceantar Whitechapel plódaithe thar a acmhainn, agus cheal oibre is tithíochta tháinig ísealaicme ar leith ar an bhfód san áit. Bhí gadaíocht, alcólachas agus foréigean ag rith damhsa ansin, agus is iomaí bean nár fágadh de shlí bheatha aici ach striapachas. I Mí Dheireadh Fómhair 1888 mheasúnaigh Údarás Póilínithe na Príomhchathrach, nó an Metropolitan Police, go raibh 1200 striapach agus 62 dhrúthlann ag obair in Whitechapel. Tháinig trioblóidí idir na dreamanna éagsúla sna sálaí ag an mbochtanas. Chuaigh dreamanna éagsúla amach ag léirsiú lena gceart a éileamh, agus na póilíní ag iarraidh na léirsitheoirí a smachtú le lámh láidir, rud nár mhaolaigh ar an míshuaimhneas ar aon nós. Bhí Whitechapel ar coipeadh le ciníochas, coirpeachas, trioblóidí sóisialta agus bochtanas, agus is é an dearcadh a bhí ag muintir na cathrach ar an gceantar gurbh é prochóg shuarach na mímhoráltachta é. Sa bhliain 1888, chuaigh dúnmharuithe Jack the Ripper ar fud na nuachtán, rud nár bhain a dhath de mhíchlú Whitechapel. San am seo bhí fir anaithnid ag ionsaí ban in East End chomh minic is go bhfuil sé deacair ainghníomhartha Jack a aithint thar an gcuid eile acu. Chuir Údarás Póilíní na Príomhchathrach aon dúnmharú déag san áireamh agus iad ag fiosrú an scéil, an chéad cheann acu rinneadh ar an 3 Aibreán 1888, agus an ceann deireanach, thit sé amach ar an 13 Feabhra, 1891. Ba iad seo "dúnmharuithe Whitechapel" de réir théarmaíocht na bpóilíní, ach is doiligh a rá arbh é an ciontóit céanna a rinne iad go léir. Go bunúsach glactar le cúig cinn acu mar "chúigear canónta", is é sin, na dúnmharuithe a bhfuil lorg láimhe Jack le haithint orthu. Is iad comharthaí sóirt a chuid oibre ná gearrthaí doimhne sa scornach, drochíde a tugadh do na baill ghiniúna, baint an inneachair as an mbolg agus lorg an fhoréigin ar an aghaidh, dar leis an gcuid is mó acu siúd a chuir spéis i scéal Jack. An chéad dá chás a fiosraíodh mar dhúnmharuithe i Whitechapel, ní áirítear ar an gcúigear canónta iad. Ba iad Emma Elizabeth Smith agus Martha Tabram na híospartaigh. Rinneadh robáil agus ionsaí gnéis ar Smith i Sráid Osborn, Whitechapel ar an 3 Aibreán, 1888. Sádh maide de chineál éigin isteach ina faighin, ionas gur polladh an peireatóineam aici, agus fuair sí bás le hathlasadh an pheireatóinéim an lá arna mhárach in Ospidéal Londan (inniu: Ospidéal Ríoga Londan, i mBóthar Whitechapel). Dúirt sí gur ionsaigh beirt nó triúr fear í, agus nach raibh i nduine acu ach déagóir. Bhí na hiriseoirí comhaimseartha ag áitiú gur bhain an t-ionsaí seo le sraith na ndúnmharuithe i Whitechapel, ach is dóigh leis an gcuid is mó de na húdair a bhfuil ábhar éigin scríofa acu faoi Jack nach raibh i gceist ach foréigean droinge nach raibh baint aige le Jack ar aon nós. Maraíodh Martha Tabram ar an 7 Lúnasa, 1888, agus d'aithin lucht na foiréinsice 39 gcneá sáite ar a colainn. Chomh brúidiúil is a bhí an cás, bhí na póilíní claonta chun a shíleadh gurbh é Jack a rinne an obair, ach inniu, glactar leis gur murdaróir éigin eile a bhí i gceist. Cé gur tugadh drochíde don bhean bhocht, níorbh í an drochíde chéanna a thugadh Jack dá chuid íospartach. Is iad an "cúigear canónta" ná Mary Ann Nichols, Annie Chapman, Elizabeth Stride, Catherine Eddowes, agus Mary Jane Kelly. Thángthas ar chorpán Nichols timpeall ar fiche nóiméad roimh a ceathair a'chlog ar maidin Dé hAoine 31 Lúnasa 1888 ar an tsráid ar a dtugtaí Buck's Row san am - is é sin, Sráid Durward, Whitechapel, mar is aithin do lucht an lae inniu í. Bhí dhá ghearradh domhain trasna an sceadamáin, agus cneá dhomhain sprochailleach in íochtar an bhoilg, chomh maith le mionghearrthaí a bhí déanta leis an scian chéanna. 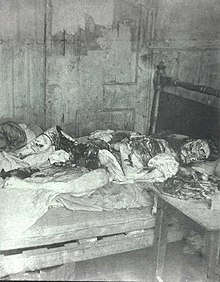 Tugadh corpán Annie Chapman faoi deara timpeall ar a sé a chlog ar maidin Dé Sathairn 8 Meán Fómhair 1888 in aice leis an cúldoras ag 29 Sráid Hanbury, Spitalfields. Bhí an scornach gearrtha faoi dhó, mar a bhí ar Nichols. Bhí an bolg scortha suas go hiomlán, agus ní ba deireanaí cuireadh cronú san útaras. Nuair a bhí an cróinéir ag déanamh a fhiosrúcháin féin, dúirt finné amháin go bhfaca sé Chapman timpeall ar a leathuair i ndiaidh a cúig ar maidin agus fear dubh "leath giobach, leath galánta" ina cuideachta. Maraíodh Stride agus Eddowes go moch ar maidin, Dé Domhnaigh, 30 Meán Fómhair 1888. Thángthas ar chorpán Stride timpeall ar bhuille a chlog ar maidin in Dutfield's Yard, in aice le Sráid Berner (inniu, Sráid Henriques), Whitechapel. Ba é ba thrúig bháis di ná gearradh glan amháin sa phríomhartaire ar an taobh clé dá muineál. Ní raibh an ghnáth-drochíde le feiceáil ar íochtar a boilg, áfach, agus mar sin tá siad ann nach bhfuil cinnte gur chóir í a áireamh ar duine d'íospartaigh Jack. Na finnéithe a shíl go raibh siad tar éis Stride a aithint i gcuideachta fir roimhe sin, ní raibh siad ar aon fhocal faoi éagasc an fhir, nó bhí cuid acu ag áitiú gur fear geal gléigeal a bhí ann, an chuid eile den tuairim gur fear dubh duairc a bhí i gceist; cuid acu dúirt siad gur gioblachán bocht a bhí ann, an chuid eile barúlach go raibh sé ag caitheamh culaith ghalánta. Tugadh an leathanach seo cothrom le dáta an 24 Samhain 2018 ag 12:13.